Sayers Journey: Holy haberdashery, Batman! Holy what??? Actually, it's Holy 15 weeks, Batman! It honestly took me by surprise today when I realized I was 15 weeks pregnant! Where has the time gone? Do you realize that I'm nearly half way? Granted the half way mark is at 20 weeks, which is 5 weeks away. But in the whole scheme of things, that's not far away. I mean, compared to the 40 weeks of gestation, 5 weeks is nothing! According to the "professionals", Baby Sayers is approximately 3.5 to 4 inches in length, head to bum and about 2 oz. Roughly the size and weight of an apple. And what a cute little apple he must be right now! He could possibly be sucking his thumb right now! He's practicing his breathing and his taste buds are forming. His legs are now longer than his arms. He is just growing like crazy!!! And to commemorate this fantastic achievement... here's a belly picture. Not the usual with the gray shirt, no face in the pic, against the bedroom wall either. This is in the nursery and shows my face and all. 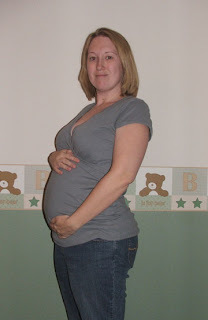 And I'm sporting my new jeans from Motherhood Maternity and a cute little shirt from Old Navy. Honestly, I think my face is getting rounder too, noticed that yesterday. You have the pregnancy glow :) So happy for you!! Congrats on 15 weeks! ahh look how pregnant you are!!! I love it!! joelle is right, you have got the glow!! eeeee so happy for you!